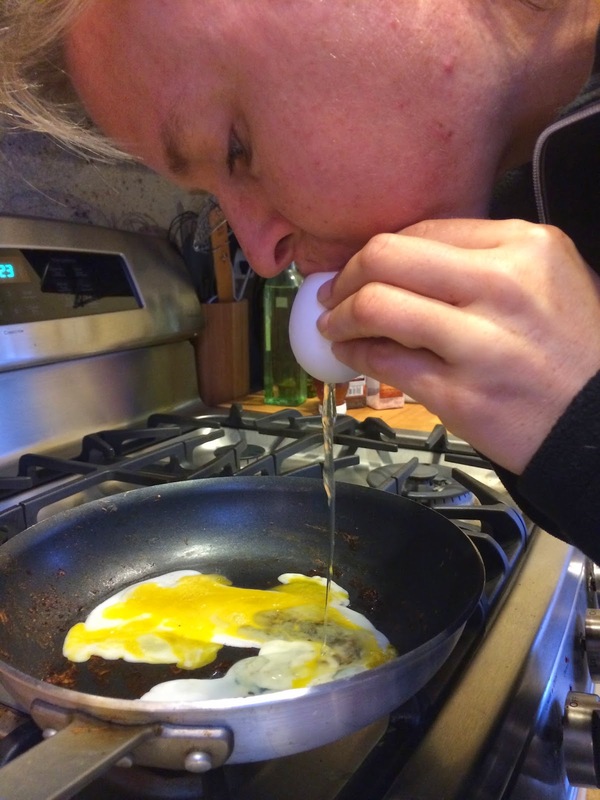 Recovering Working Mom: Eggscelent fun!! 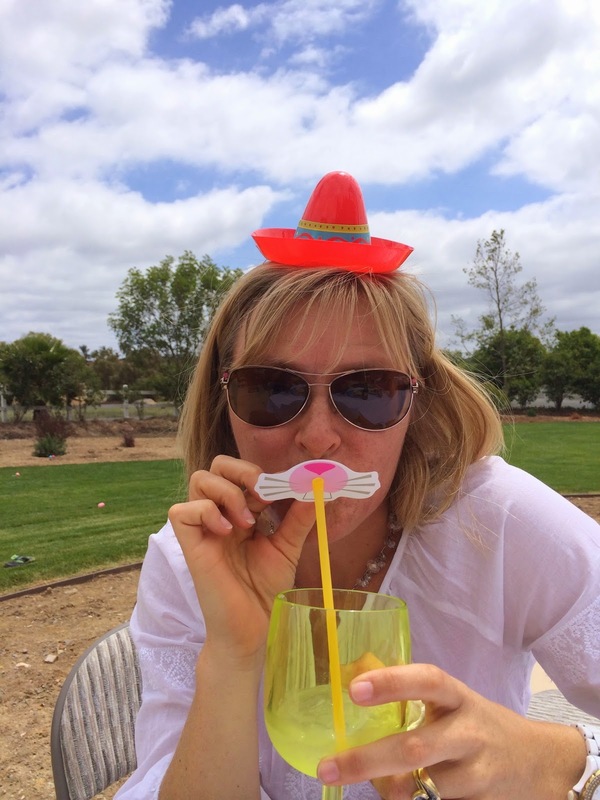 It's the eve of Easter and mommy is so grateful for the fun that this season brings! 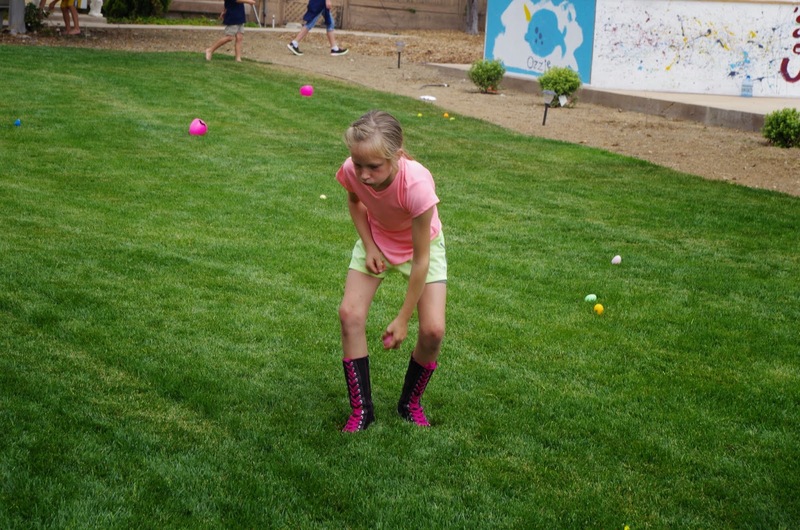 Last weekend we continued our Fools Egg Cinco tradition, and this time we made it an Egg Hunt with a Heart! 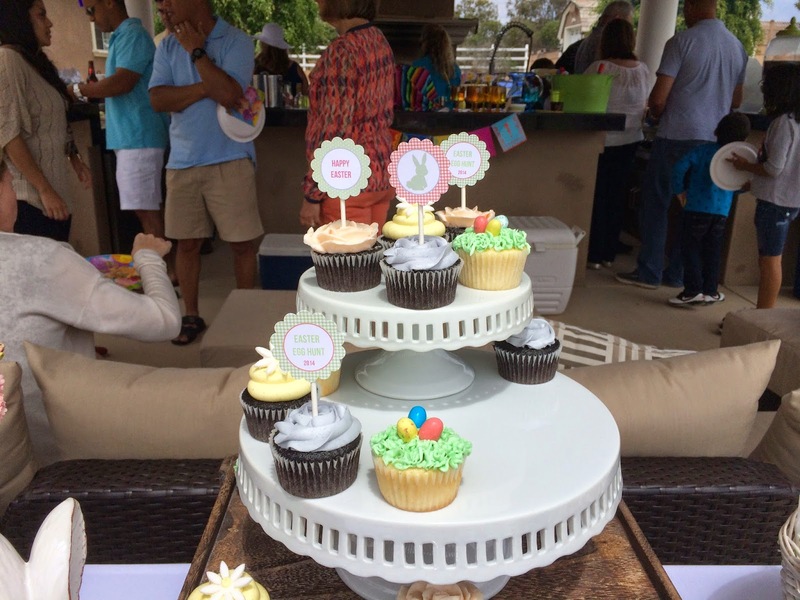 In addition to all the fun for the kids (and of course margaritas for adults), we helped support Just in Time for Foster Youth, a fantastic organization for foster youth aged 18-26 who have “aged out” of the foster care system. 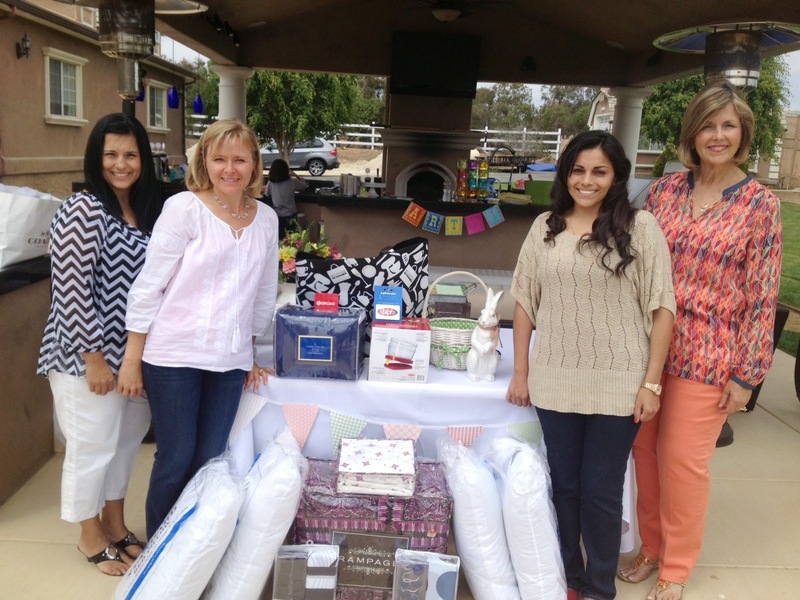 Attendees brought dishes, home items, gift cards, bedding, and several other items to help these young adults get their first homes and become self sufficient. Huge thank you to my Aunt Pam who is a Board member and Melissa, a JIT employee and former client who came out to share information and also enjoy our shenanigans. 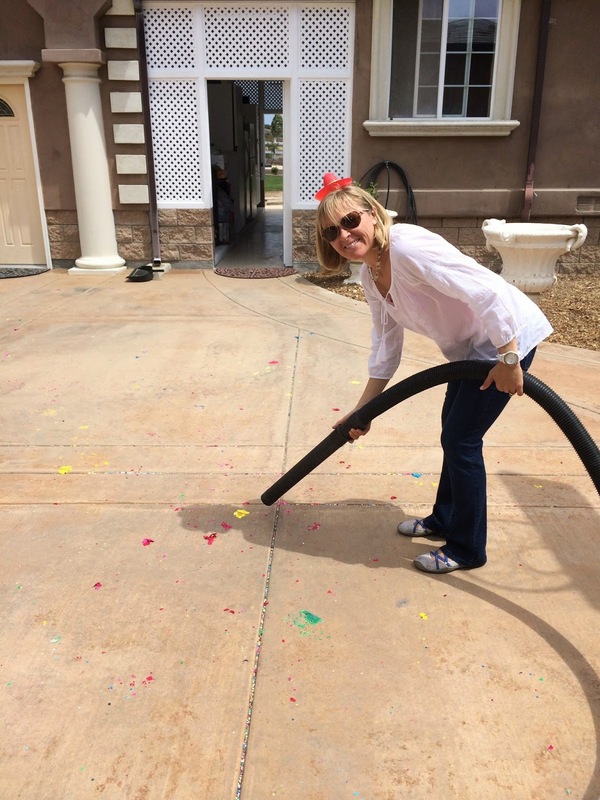 We also had the party styled by Melinda Bertrand and Sparkleberry Studio (as you’ll see below, I make the messes while Melinda makes the party sparkle!). 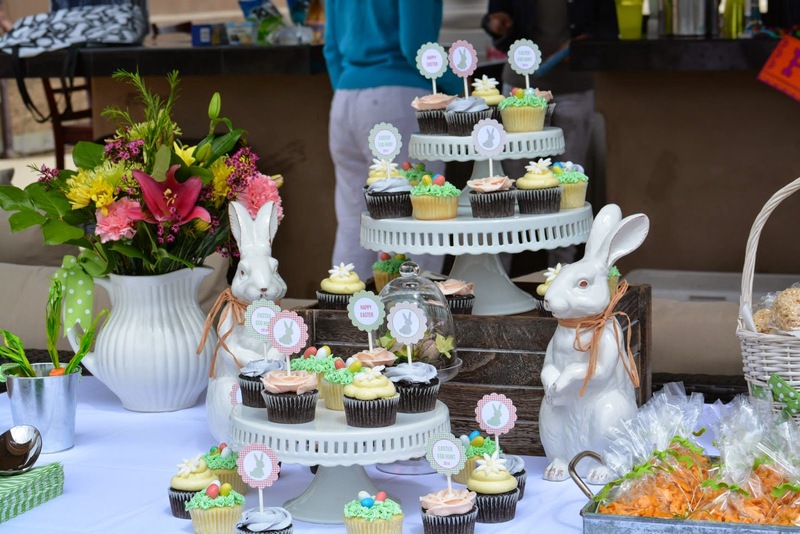 We also had fabulous and beautiful cupcakes by Marianne Daquino! 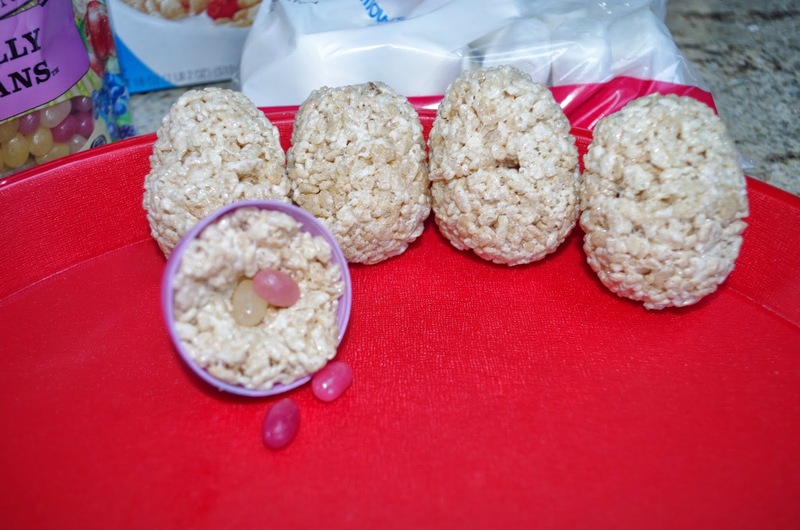 1) When your middle child asks “hey mom, can we have confetti eggs?” GET OFF F*&#ING PINTEREST and DO NOT try to attempt to make them yourself. For if you do, you will find yourself winded from trying to blow out the egg goo, only to have the f*#&ing puppy eat the FOUR eggs that you worked ½ hour to empty. D@mn dog ate all of the eggs we worked so hard to clean out. I should make these things on my own. F*#&ing Pinterest!! So, mommy gave up and decided to buy them online. Got these at amols.com - we did lose a couple in shipping, but the kids didn't care - we scattered it all anyway! Admitting to daddy that you would have paid the $36 if you had to because these things were so dang cool . . . PRICELESS. 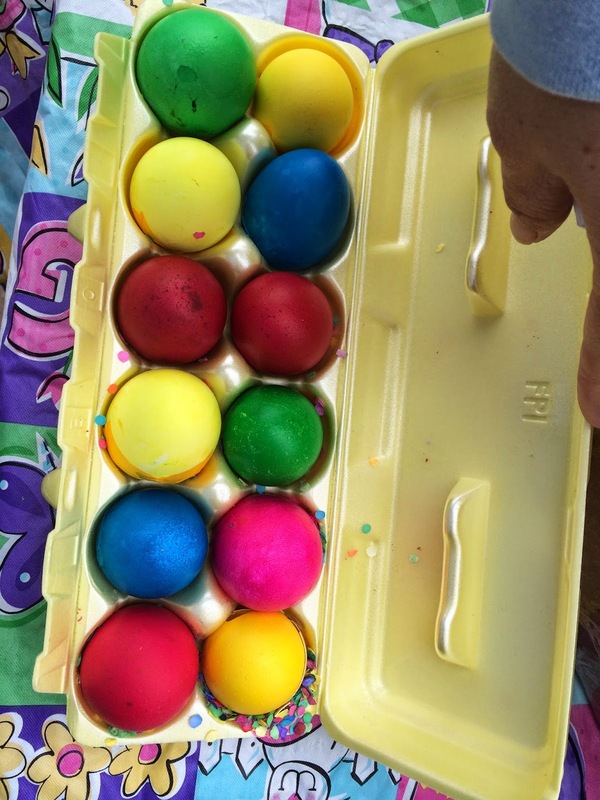 These eggs made a HUGE mess, but the kids absolutely loved them, and so did the adults!! Lets not kid ourselves, I didn't actually clean up the mess. I made someone else do it, I just posed for this picture! 2) DO NOT leave mommy unattended with straws in her skinny girl. These were such fun straws that Aunt Pam brought!! 3) DO NOT give your daredevil middle child a parachuting bunny. 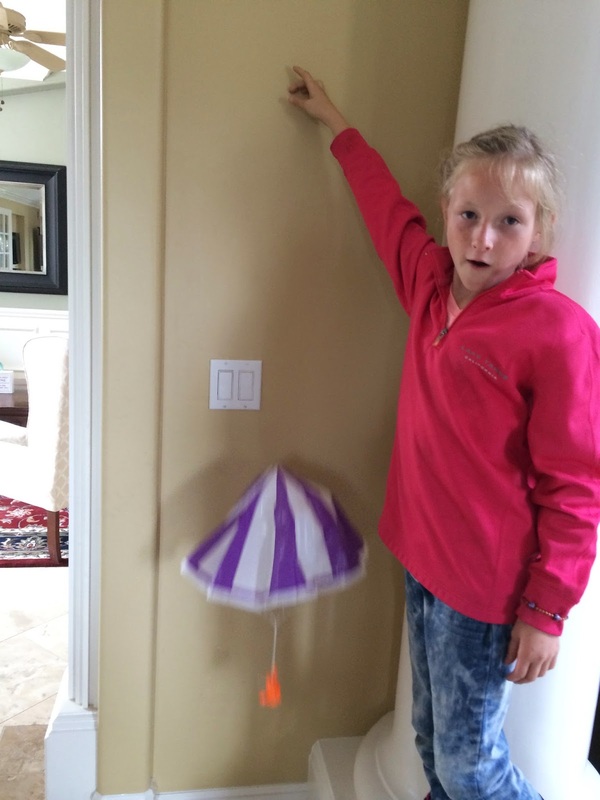 For if you do, you may have her ask you if she can remove the bunny’s parachute, strap it to herself and jump off the playhouse. No, I am NOT kidding; girlfriend actually asked me that. When I explained the physics of that proposition she said “well, then I’m just gonna need a backpack, tablecloth and some string”. This, of course, is the same child who makes suspenders out of twine and casts out of toilet paper and tape. I've already hidden all the backpacks and tablecloths! Of course I forgot to take a picture of the really cute ones with stickers, etc. 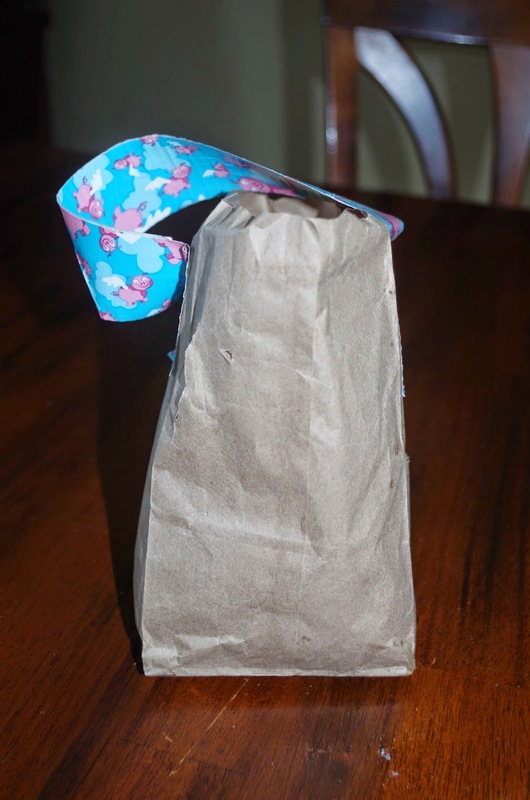 But, you get the idea - the kids cut a paper bag to the size they want and make duct tape handles. This was a good distraction activity. 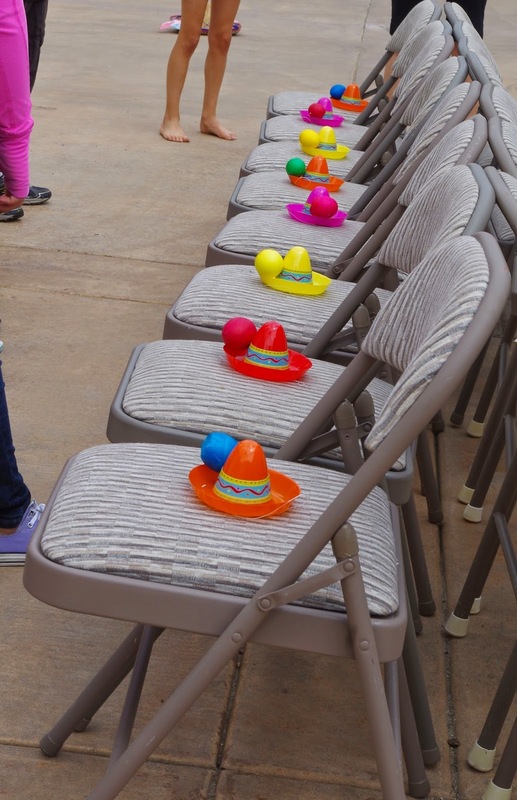 There were two ways to lose on this one - not find a chair OR drop your egg! 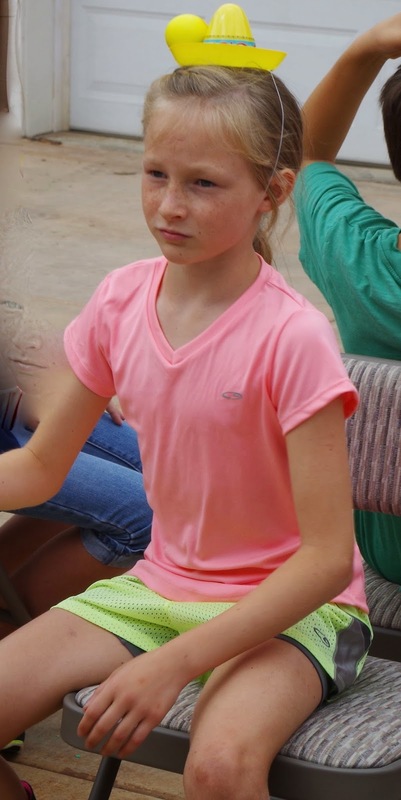 The kids competed against another team (whoever got the most eggs in won). 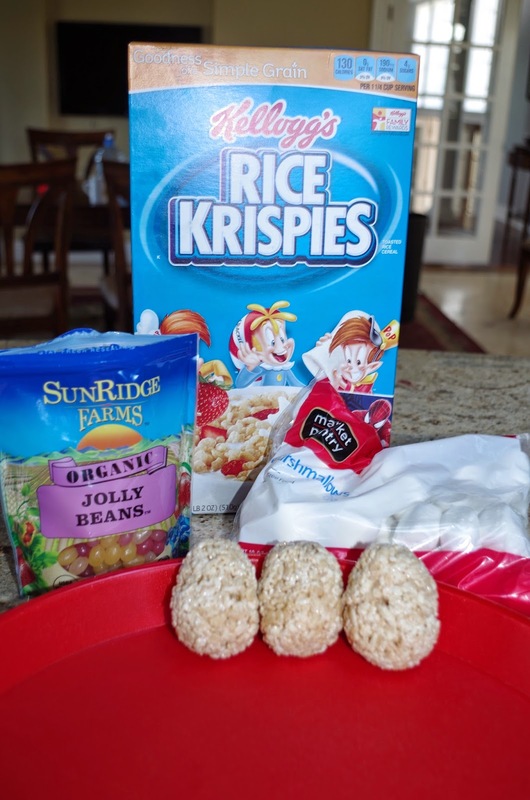 We put in organic jelly beans! 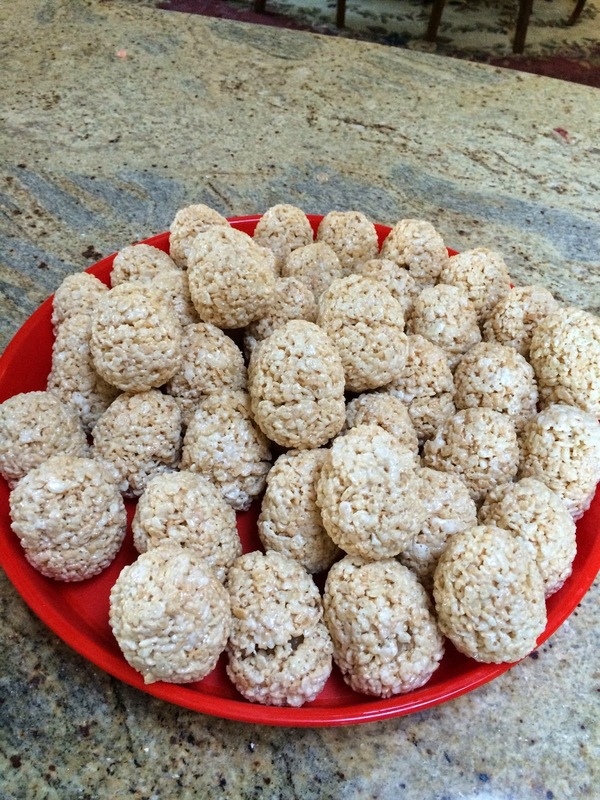 These were so yummy and the kids AND adults loved them!! 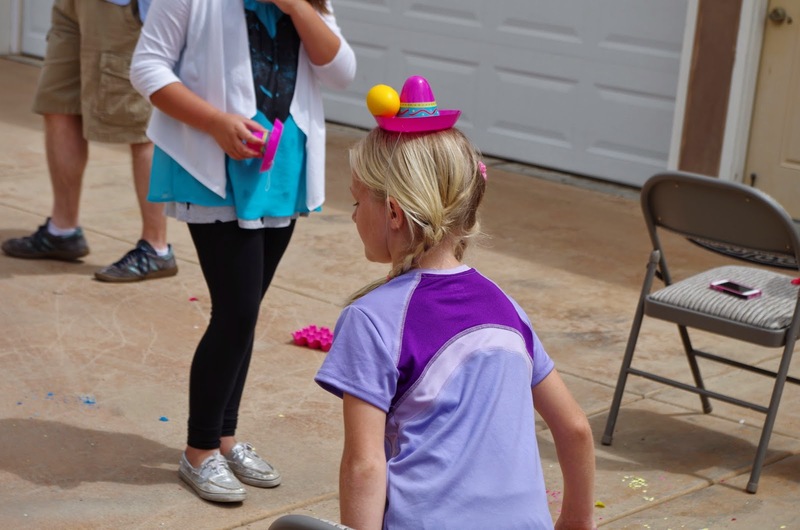 It wouldn't be Fools Egg Cinco without some foolin'! 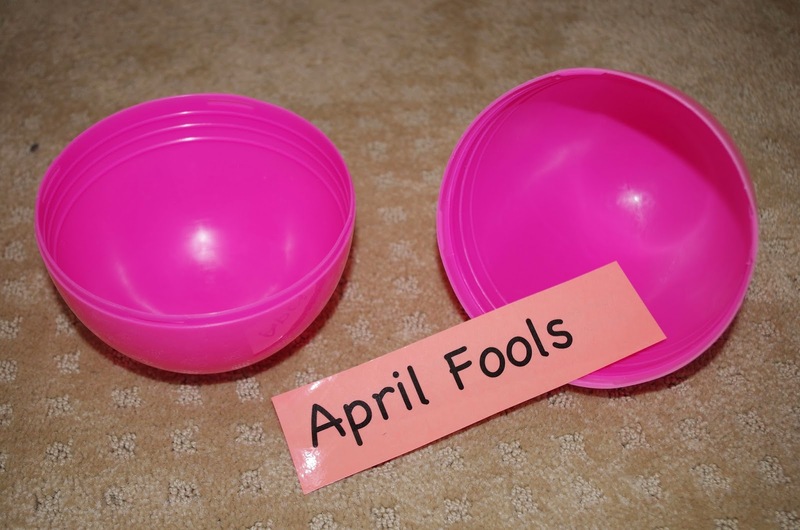 So, rather than just put the eggs out for the big kids, I made them work for their eggs. 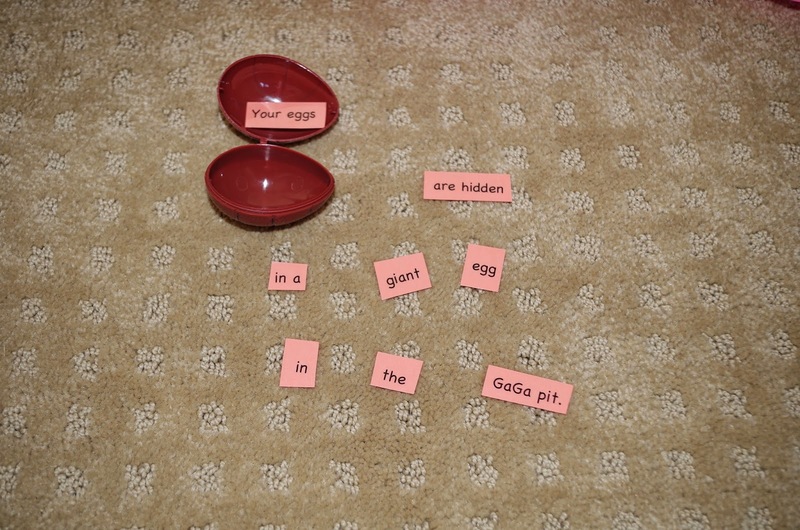 They had to go on a scavenger hunt to find their eggs. 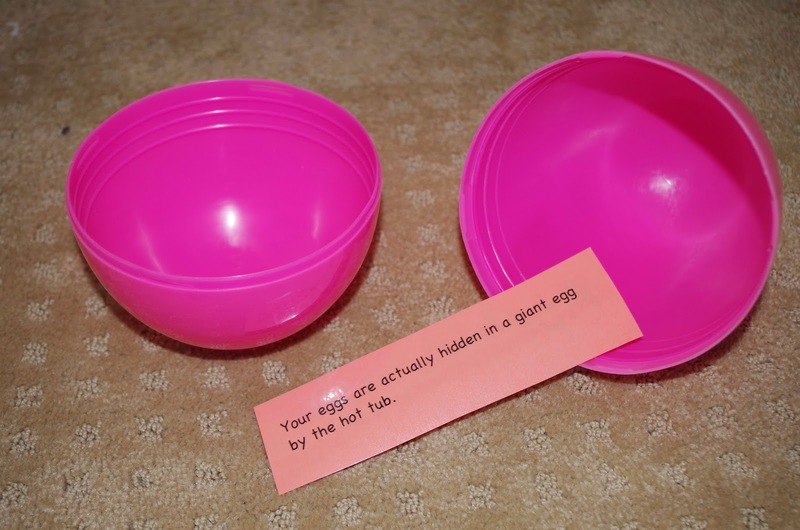 I hid the clues to the where their real eggs were in several other eggs. 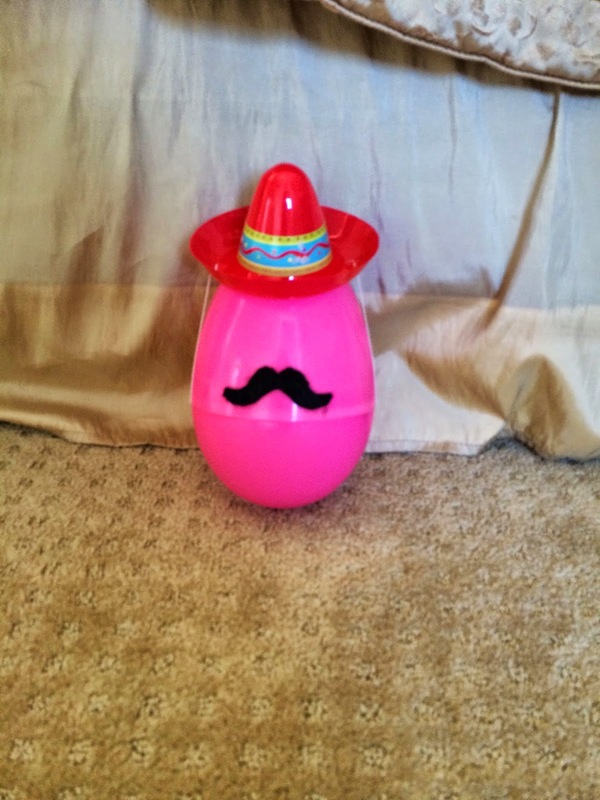 friend EggCinco Valdez (Rather than Juan Valdez, of course). 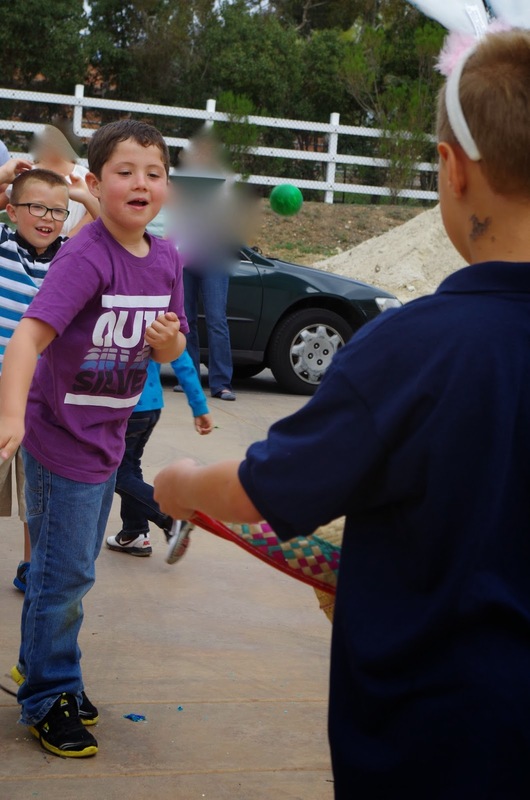 And of course, it wouldn't be Runamuk fun without some good old egg smashing (on the adults' heads)! 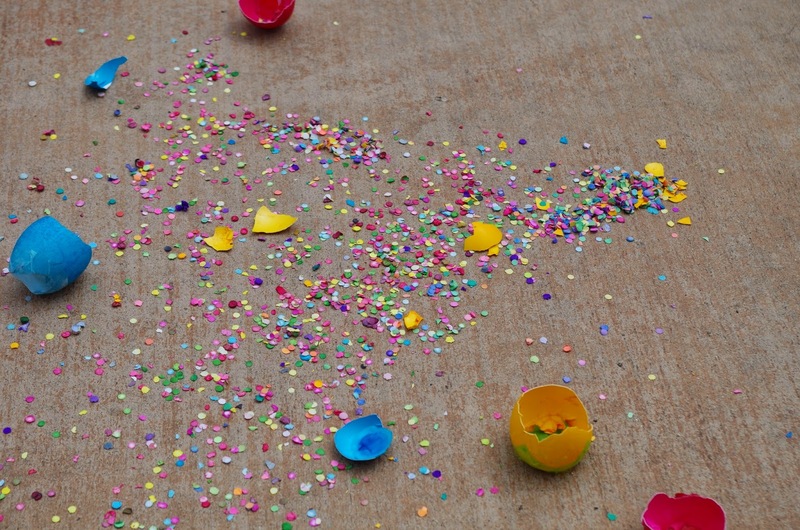 We had confetti eggs left over and all the adults were good sports and let the kids smash them on their backs! Aunt Pam was the greatest sport and let the Ego give her a new hairstyle! Those are goldfish crackers in plastic bags with green ties. Love that idea (that is all Melinda and Sparkleberry). 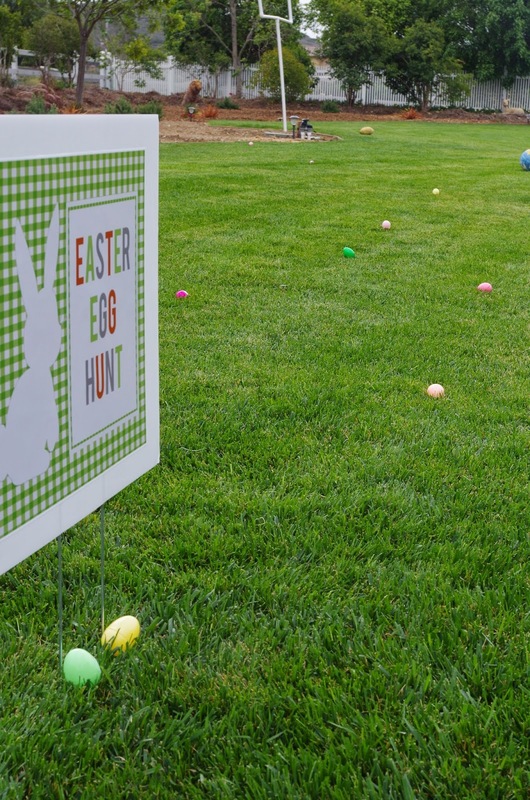 Nothing says good ole Easter fun like eggs all over the grass! That are then picked up and the chocolate eaten out of by your 10 year old! Wishing everyone a wonderful Easter/Passover!! Mommy's sooooo grateful for her break . . .
Fool me once . . . part deux!